Sony's high resolution XCL-5005 monochrome video camera incorporates a new Sony 2/3-type Progressive Scan CCD sensor with square pixels. This 5-Megapixel CCD camera provides exceptional picture quality( 2,448 x 2,050 pixels) and captures video at 15 frames per second. This camera adopts the AIA PoCL standard (Power over Camera Link) and features auto-selectable power from an EIAJ or PoCL connector. The XCL-5005 also features a multitude of functions such as vertical and horizontal partial scanning, built-in real-time hardware pre-processing, and flexible high-speed outputs. These functions are extremely beneficial to machine vision applications including large part inspection, PCB inspection, semi-mounting and bonding machinery and microscopy. The XCL-5005 is compatible with a wide variety of commercially available Camera Link frame grabbers. Sony's high resolution XCL-5005CR color video camera incorporates a new Sony 2/3-type Progressive Scan CCD sensor with square pixels. This 5-Megapixel CCD camera provides exceptional picture quality( 2,448 x 2,050 pixels) and captures video at 15 frames per second. This camera adopts the AIA PoCL standard (Power over Camera Link) and features auto-selectable power from an EIAJ or PoCL connector. The XCL-5005CR also features a multitude of functions such as vertical and horizontal partial scanning, built-in real-time hardware pre-processing, and flexible high-speed outputs. These functions are extremely beneficial to machine vision applications including large part inspection, PCB inspection, semi-mounting and bonding machinery and microscopy. The XCL-5005CR is compatible with a wide variety of commercially available Camera Link frame grabbers. Ultra-compact XCL-U100 monochrome High Resolution Power over CameraLink (PoCL) Video Camera, incorporates a 1/1.8-type progressive scan IT CCD that captures outstanding UXGA resolution images at 15 frames per second. In addition, the XCL-U100 conforms to the AIA's PoCL (power over CameraLink) standard and accepts power from an EIAJ or PoCL connector, and power can be provided with the same connector for a more streamlines back-end solution. One Cable For Power and Video! Designed to capitalize on all the benefits of digital technology and to minimize the connectivity challenges, Sony has introduced a new line up of digital Camera Link® compatible cameras. The XCL-U1000 camera incorporates a 1/1.8 type progressive scan CCD that produces detailed, UXGA resolution images (1,600 x 1,200 pixels). Sony's new XCL-U1000 camera is equipped with a digital video interface that conforms to the Camera Link industry standard and captures high-speed, high-resolution images while simplifying connectivity to machine vision systems with its MDR 26-pin cable. Designed to capitalize on all the benefits of digital technology and to minimize the connectivity challenges, Sony has introduced a new line up of digital Camera Link® compatible cameras. The XCL-U1000C color camera incorporates a 1/1.8 type progressive scan CCD that produces detailed, UXGA resolution images (1,600 x 1,200 pixels). Sony's new XCL-U1000C camera is equipped with a digital video interface that conforms to the Camera Link industry standard and captures high-speed, high-resolution images while simplifying connectivity to machine vision systems with its MDR 26-pin cable. Sony continues to be on the cutting edge of camera technology with the latest addition to its industrial camera line up - The XCG GigE Series. The XCG-5005E incorporates the GigE Vision interface which is specifically standardized for machine vision applications based on Gigabit Ethernet Technology. The GigE interface enables the camera to transfer a large amount of data over long distances. The use of an Ethernet cable and availability of a wide variety of peripheral devices contribute to significant cost-cutting benefits when designing a complete vision system. Moreover, by incorporating a packet re-send mechanism, the XCG-5005E can securely transmit data to the host computer. The C-mounted camera measures 44 x 33 c 67.5mm, delivers a resolution depth of up to 12 bits per pixel with a shutter speed of 1/100,000 and enables 0-18dB of gain control with 0-6dB of digital gain. Sony continues to be on the cutting edge of camera technology with the latest addition to its industrial camera line up - The XCG GigE Series. The XCG-SX97E incorporates the GigE Vision interface which is specifically standardized for machine vision applications based on Gigabit Ethernet Technology. The GigE interface enables the camera to transfer a large amount of data over long distances. The use of an Ethernet cable and availability of a wide variety of peripheral devices contribute to significant cost-cutting benefits when designing a complete vision system. Moreover, by incorporating a packet re-send mechanism, the XCG-SX97E can securely transmit data to the host computer. The C-mounted camera measures 44 x 33 c 67.5mm, delivers a resolution depth of up to 12 bits per pixel with a shutter speed of 2 to 1/100,000 and enables 0-18dB of gain control with 0-6dB of digital gain. Sony continues to be on the cutting edge of camera technology with the latest addition to its industrial camera line up - The XCG GigE Series. The XCG-U100E incorporates the GigE Vision interface which is specifically standardized for machine vision applications based on Gigabit Ethernet Technology. The GigE interface enables the camera to transfer a large amount of data over long distances. The use of an Ethernet cable and availability of a wide variety of peripheral devices contribute to significant cost-cutting benefits when designing a complete vision system. Moreover, by incorporating a packet re-send mechanism, the XCG-U100E can securely transmit data to the host computer. The C-mounted camera measures 44 x 33 c 67.5mm, delivers a resolution depth of up to 12 bits per pixel with a shutter speed of 2 to 1/100,000 and enables 0-18dB of gain control with 0-6dB of digital gain. Sony continues to be on the cutting edge of camera technology with the latest addition to its industrial camera line up - The XCG GigE Series. The XCG-V60E incorporates the GigE Vision interface which is specifically standardized for machine vision applications based on Gigabit Ethernet Technology. The GigE interface enables the camera to transfer a large amount of data over long distances. The use of an Ethernet cable and availability of a wide variety of peripheral devices contribute to significant cost-cutting benefits when designing a complete vision system. Moreover, by incorporating a packet re-send mechanism, the XCG-V60E can securely transmit data to the host computer. The C-mounted camera measures 44 x 33 c 67.5mm, delivers a resolution depth of up to 12 bits per pixel with a shutter speed of 1/100,000 and enables 0-18dB of gain control with 0-6dB of digital gain. Conference rooms and boardrooms everywhere are going HD, and Sony's EVI-HD1 takes the headache out of this transition with the flip of a switch - literally. Sony is adding a high-definition model to its EVI camera series. Since it is also compatible with standard definition (SD), this unique p/t/z camera allows you to take the first step in HD migration. The EVI-HD1 camera combines a high-quality HD color video camera with the flexibility of remote pan/tilt/zoom operation. With 14 formats to choose from (including eight HD types and six SD video formats), this new dynamic camera allows end-users to decide when they are ready to migrate from SD to HD. The EVI-HD1 is compatible today with existing videoconferencing systems and will be compatible tomorrow with HD based ones. It also inherits many outstanding features from the EVI-D100 P/T/Z camera and couples these with superb HD picture quality. Smooth, high-speed pan/tilt operation, 16x9 aspect ratio images and a built-in 10x optical zoom/wide angle lens, make the EVI-HD1 ideal for small to medium size conference rooms. The EVIHD3V, a 720p HD Pan/Tilt/Zoom camera delivers intricately detailed and vivid images, enhancing your videoconferencing or training meeting with true-to-life images of participants. The EVIHD3V is equipped with a DVI-I interface designed to maximize high video quality displays and is capable of displaying both digital and analog signals (output is selectable from Y/Pb/Pr and RGB). The EVIHD3V utilizes a direct drive motor mechanism for achieving high-speed, quiet and smooth P/T/Z operations. The camera covers a wide shooting range, with a pan angle of -100° to +100°, with a max pan speed of 300°/s, tilt angle of -25° to +25°, with a max tilt speed of 125°/s. The EVIHD7V, a 1080i High Definition Pan/Tilt/Zoom camera delivers intricately detailed and vivid images, enhancing your videoconferencing or training meeting with true-to-life images of participants. The EVIHD7V is equipped with a DVI-I interface designed to maximize high video quality displays and is capable of displaying both digital and analog signals (output is selectable from Y/Pb/Pr and RGB). The EVIHD7V utilizes a direct drive motor mechanism for achieving high-speed, quiet and smooth P/T/Z operations. The camera covers a wide shooting range, with a pan angle of -100° to +100°, with a max pan speed of 300°/s, tilt angle of -25° to +25°, with a max tilt speed of 125°/s. The world of HD expanded into the industrial imaging arena with the debut of Sony’s ﬁ rst HD block camera, the FCB-H10. Now, continuing its commitment to HD picture quality for applications that require dynamic, high-resolution images that are also ﬂ exible, Sony is introducing the FCB-H11. This stunning new model extends application possibilities by incorporating a new Day/Night function that enables the camera to capture high-quality color images during the day and clear, black-and-white images at night. In addition, the FCB-H11 camera achieves a minimum illumination of 1.0 lx by dynamically removing the infrared cut ﬁ lter and allowing the spectral responsivity range to extend into the near infrared. The FCB-H11 incorporates a 1/3-type HD CMOS image sensor boasting approximately two million effective pixels, and provides a 16 x 9 aspect ratio, making it ideal for use with wide-screen displays. This camera also features multi-format video outputs, satisfying user needs for high-deﬁ nition (HD) and standard-deﬁ nition (SD) applications. When extremely clear, super picture quality HD images are required, the FCB-H11 camera offers 1080i and 720p signals. This versatile and ﬂ exible camera can also be used with an SD system to allow easy migration from SD to HD when you are ready. The FCB-H11 inherits a multitude of functions from the world-renowned FCB Series. With a 120x zooming capability, Picture Freeze function, SPOT AE function, and Slow Shutter, the FCB-H11 is ideal for applications such as inspection, video conferencing, cable TV broadcasting, and point-of-view (POV) applications. Furthermore, with the incorporation of the Day/Night function, which is essential for monitoring, this camera is a great choice for a wide range of security applications in, for example, parking lots, retail stores, and many other locations. The HXR-MC1/ACC is an easy-to-use HD camera system and accessory kit, consisting of a small camera unit, a handheld controlling unit with LCD panel and recording function and a complete accessory kit including a rechargeable battery pack, AC adapter/charger, wide conversion lens, remote commander and case. This all-in-one tiny camera system needs no extra equipment, take it out and just start shooting! Also, the camera unit is splash-proof, allowing easy usage under tough conditions, such as outdoor shooting or water-side shooting. The range of HD shooting will expand using this one-and-only camera. Moreover, the unique style of the HXR-MC1/ACC enables shooting in extraordinary conditions and angles, such as shooting sports scenes from the user’s point of view and onboard shooting in motor sports. The creative possibilities are limitless. Sony's new line up of 1394.b cameras, with a number of resolutions and frame rates to choose from, has made selecting the right camera for machine vision applications easy. The new XCD-U100 incorporates a 1/3-type progressive Scan CCD and achieves up to 15 fps at UXGA Resolution. By utilizing the IEEE1394.b Interface that supports the IIDC protocol, users can transfer images to a host PC at speeds of up to 800 Mb/s. Moreover, because multiple cameras can be connected in a daisy-chain configuration, users can enjoy the benefits of simplified operation in a multi-camera system. The XCD-U100 is ideal for industrial machine-vision applications such as object recognition, inspection, measurement, alignment and more. Sony's new line up of 1394.b cameras, with a number of resolutions and frame rates to choose from, has made selecting the right camera for machine vision applications easy. The new XCD-U100CR incorporates a 1/3-type progressive Scan CCD and achieves up to 15 fps at UXGA Resolution. By utilizing the IEEE1394.b Interface that supports the IIDC protocol, users can transfer images to a host PC at speeds of up to 800 Mb/s. Moreover, because multiple cameras can be connected in a daisy-chain configuration, users can enjoy the benefits of simplified operation in a multi-camera system. The XCD-U100CR is ideal for industrial machine-vision applications such as object recognition, inspection, measurement, alignment and more. Sony's new line up of 1394.b cameras, with a number of resolutions and frame rates to choose from, has made selecting the right camera for machine vision applications easy. The new XCD-V60 camera incorporates a 1/3 type Progressive Scan CCD and achieves up to 90 fps at VGA resolution. By utilizing the IEEE 1394.b interface that supports the IIDC protocol, users can transfer images to a host PC at speeds of up to 800 Mb/s. Moreover, because multiple cameras can be connected in a daisy-chain configuration, users can enjoy the benefits of simplified operation in a multi-camera system. The XCD-V60 is ideal for industrial machine-vision applications such as object recognition, inspection, measurement, alignment and more. The XC-555 is an ultra-compact, integrated 1/2 type IT CCD color camera ideally suited for a wide variety of applications such as machine vision, multimedia and remote monitoring. The XC-555 is designed so that a video output signal can be obtained by only providing a power supply of 12 V DC. Its ultra-compact, one-piece design eliminates the need for a bulky CCU, allowing the XC-555 camera to be easily installed in space-restricted areas. The XC-555 is a direct replacement for the XC-999 and XC-777A cameras (1/2 vs. 1/3 inch optics). The XC-555P is an ultra-compact, integrated 1/2 type IT CCD color camera ideally suited for a wide variety of applications such as machine vision, multimedia and remote monitoring. The XC-555P is designed so that a video output signal can be obtained by only providing a power supply of 12 V DC. Its ultra-compact, one-piece design eliminates the need for a bulky CCU, allowing the XC-555P camera to be easily installed in space-restricted areas. The XC-555P is a direct replacement for the XC-999P and XC-777AP cameras (1/2 vs. 1/3 inch optics). When high quality imaging at 30 frames/second with a 12-pin connector are of the essence, turn to the compact champion, Sony's new XC-56, for the solution. Featuring the same compact and light weight size as Sony's XC-HR camera series, the C-mount XC-56 B/W camera incorporates a 1/3 type Interline Transfer (IT) Progressive Scan CCD with square pixels and a VGA resolution of 659 x 494. Although the XC-56 is not a direct replacement, it features the same pin assignment as Sony's popular XC-55 camera so NO CABLE CHANGE is required when replacing the XC-56 for the XC-55 camera. The new XC-56 camera features many of the popular XC-HR50 specifications (i.e., compact size, CCD technology and functions) but at 30 frames/sec in 1N mode so it will work with existing frame grabbers and vision systems with little or no change. Sony's new XC-56 camera is the ideal solution when you need a progressive scan camera at an affordable price. Designed to comply with the pin-out of Sony's discontinued XC-55BB camera, Sony's new two piece, black and white progressive scan video camera - the XC-56BB - incorporates a 1/3-type progressive scan CCD that produces detailed, VGA resolution image (647 x 493 pixels) at a high frame rate (30 frame per second/60 frames per second binned). Designed in a miniature body, the new XC-56BB camera inherits all the outstanding features of the XC-56 camera, but it is "form fitted" to the XC-55BB camera body. 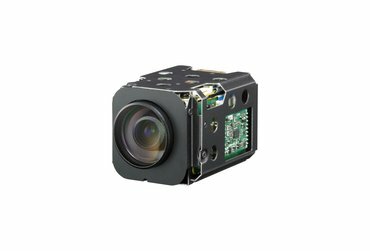 Specifically designed for image processing and machine vision professionals, Sony's XC-EI30 is the smallest and lightest one-piece 1/3-inch analog B/W video camera in the company's line to date. It features the same CCD technology and improved specifications that are incorporated in the XC-ST70/50/30 series (e.g., simplified and flexible trigger, excellent vibration and shock characteristics) but in an even smaller and lighter package. In order to achieve this extremely small size, the BNC connector has been removed from the XC-EI30 camera. This camera incorporates the latest 1/3" Interline Transfer (IT) CCD with HAD technology providing 768 (H) x 494 (V) effective picture elements and feature a C-mount type lens mount. When used with an IR LED illuminator, this camera can capture images in very low light environments and/or easily detect features that are more distinguishable in IR illumination. Ideal for image processing and machine vision applications and weighing only 60 grams, Sony's XC-EI50 video camera is the smallest and lightest one-piece 1/2-inch analog B/W video camera in Sony's lineup to date. This camera features the same CCD technology and improved specifications that are incorporated in the XC-ST70/50/30 series (e.g., simplified and flexible trigger, excellent vibration and shock characteristics) but in an even smaller and lighter package. In order to achieve this extremely small size, the BNC connector has been removed from the XC-EI50 camera. This camera incorporates the latest ½ type Interline Transfer (IT) CCD with HAD technology providing 768(H) x 494 (V) effective picture elements and features a C-mount type lens mount. When used with an IR LED illuminator, this camera can capture images in very low light environments and/or easily detect features that are more distinguishable in IR illumination. Ideal for image processing and machine vision applications and weighing only 60 grams, Sony's XC-EI50CE video camera is the smallest and lightest one-piece 1/2-inch analog B/W video camera in Sony's lineup to date. This camera features the same CCD technology and improved specifications that are incorporated in the XC-ST70/50/30 series (e.g., simplified and flexible trigger, excellent vibration and shock characteristics) but in an even smaller and lighter package. In order to achieve this extremely small size, the BNC connector has been removed from the XC-EI50CE camera. This camera incorporates the latest ½ type Interline Transfer (IT) CCD with HAD technology providing 752(H) x 582 (V) effective picture elements and features a C-mount type lens mount. When used with an IR LED illuminator, this camera can capture images in very low light environments and/or easily detect features that are more distinguishable in IR illumination. Ideal for image processing and machine vision applications, Sony's 50-gram XC-ES30 is part of Sony's new standard of analog B/W video cameras. This camera features the same CCD technology and improved specifications that are incorporated in the XC-ST70/50/30 series (e.g., simplified and flexible trigger, excellent vibration and shock characteristics) but in an even smaller and lighter package. This camera incorporates the latest 1/3 type Interline Transfer (IT) CCD with HAD technology providing 768 (H) x 494 (V) effective picture elements and features a C-mount type lens mount. 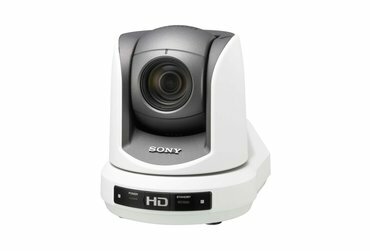 Sony's EVI-D100 camera is ideal for applications such as videoconferencing, distance learning, surveillance, conference and training rooms, courtrooms, houses of worship, internet communications and just about any application that requires a high-quality color video camera with the flexibility of remote pan/tilt/zoom operations. The EVI-D100 is a high quality CCD cameras that combine a high-speed, quiet pan/tilt with a wide angle view and 40x zoom (10x optical + 4x digital), all in a compact, easy-to-use package. The EVI-D100 camera boasts impressive and innovative features such as auto focus, auto white balance and automatic exposure control which provide fast and stable hands free operation when the camera changes pan/tilt positions. Sony's new EVI-D100P camera is ideal for applications such as videoconferencing, distance learning, surveillance, conference and training rooms, courtrooms, houses of worship, internet communications and just about any application that requires a high-quality color video camera with the flexibility of remote pan/tilt/zoom operations. The EVI-D100P is a high quality CCD cameras that combine a high-speed, quiet pan/tilt with a wide angle view and 40x zoom (10x optical + 4x digital), all in a compact, easy-to-use package. The EVI-D100P camera boasts impressive and innovative features such as auto focus, auto white balance and automatic exposure control which provide fast and stable hands free operation when the camera changes pan/tilt positions. The EVI-D100/100P cameras join the popular EVI-D30/D31 as Sony expands its pan/tilt camera line. Take control with Sony's newest robotic pan/tilt/zoom color video camera - the new EVI-D70 - the successor to the industry leading EVI-D30. The EVI-D70 combines a high quality 1/4 type EXview HAD™ CCD color camera with the flexibility of a remote pan/tilt/zoom operation, all in a compact easy-to-use package. Compared to its predecessor, this superior EVI-D70 camera incorporates a wider pan/tilt range with an 18x optical zoom lens and a faster pan/tilt mechanism, making them ideal for distance learning, video conferencing, houses of worship, courtrooms, hospitals and nursing homes, events and concert halls, and just about any other remote shooting application. And best of all, it's ceiling mountable - a first for Sony's popular EVI cameras! Take control with Sony's newest robotic pan/tilt/zoom color video camera - the new EVI-D70 - the successor to the industry leading EVI-D30. NOW AVAILABLE IN A WHITE VERSION (EVI-D70/W), the EVI-D70 combines a high quality 1/4 type EXview HAD™ CCD color camera with the flexibility of a remote pan/tilt/zoom operation, all in a compact easy-to-use package. Compared to its predecessor, this superior EVI-D70/W camera incorporates a wider pan/tilt range with an 18x optical zoom lens and a faster pan/tilt mechanism, making them ideal for distance learning, video conferencing, houses of worship, courtrooms, hospitals and nursing homes, events and concert halls, and just about any other remote shooting application. And best of all, it's ceiling mountable - a first for Sony's popular EVI cameras! Take control with Sony's newest robotic pan/tilt/zoom color video camera - the new EVI-D70P - the successor to the industry leading EVI-D31. The EVI-D70P combines a high quality 1/4 type EXview HAD™ CCD color camera with the flexibility of a remote pan/tilt/zoom operation, all in a compact easy-to-use package. Compared to its predecessor, this superior EVI-D70 camera incorporates a wider pan/tilt range with an 18x optical zoom lens and a faster pan/tilt mechanism, making it ideal for distance learning, video conferencing, houses of worship, courtrooms, hospitals and nursing homes, events and concert halls, and just about any other remote shooting application. And best of all, it's ceiling mountable - a first for Sony's popular EVI cameras! Take control with Sony's newest robotic pan/tilt/zoom color video camera - the new EVI-D70P - the successor to the industry leading EVI-D31. NOW AVAILABLE IN A WHITE VERSION (EVI-D70P/W), the EVI-D70P combines a high quality 1/4 type EXview HAD™ CCD color camera with the flexibility of a remote pan/tilt/zoom operation, all in a compact easy-to-use package. Compared to its predecessor, this superior EVI-D70 camera incorporates a wider pan/tilt range with an 18x optical zoom lens and a faster pan/tilt mechanism, making it ideal for distance learning, video conferencing, houses of worship, courtrooms, hospitals and nursing homes, events and concert halls, and just about any other remote shooting application. And best of all, it's ceiling mountable - a first for Sony's popular EVI cameras! Sony's new FCB-EX1000 camera offers excellent picture quality and extremely high zoom capability. The FCB-EX1000 color block camera combines a new exceptionally high 36X zoom lens with an expansively wide/telephoto horizontal field of view. The FCB-EX1000 camera incorporates a ¼ type EXview HAD™ CCD for high sensitivity in extreme low light environments. For optimized sensitivity in both day and night-time shooting applications, the FCB-EX1000 camera incorporates an Auto ICR function and excels in security domes and traffic monitoring applications. Sony's new FCB-EX1000P camera offers excellent picture quality and extremely high zoom capability. The FCB-EX1000P color block camera combines a new exceptionally high 36X zoom lens with an expansively wide/telephoto horizontal field of view. The FCB-EX1000P camera incorporates a ¼ type EXview HAD™ CCD for high sensitivity in extreme low light environments. For optimized sensitivity in both day and night-time shooting applications, the FCB-EX1000 camera incorporates an Auto ICR function and excels in security domes and traffic monitoring applications. The FCB-EX1010 color block camera incorporates ¼ type ExView HAD™ CCD along with exceptional picture quality and high zoom capabilities (432x w/optical zoom). In addition, the new FCB-EX1010 is the first in this exceptional camera series to feature a 36x zoom lens with Wide-D, as well as horizontal resolution of 530 TV lines, improved motion detection, spherical privacy zone masking with mosaic effect, and enhanced multi lines (more than two) for title. The FCB-EX1010 also features a slow AE Response Function that automatically slows the rate at which the exposure level changes. The rate can be set up to 32 times slower than when the Full Auto mode or Priority mode is selected. The FCB-EX1010P color block camera incorporates ¼ type ExView HAD™ CCD along with exceptional picture quality and high zoom capabilities (432x w/optical zoom). In addition, the FCB-EX1010P is the first in this exceptional camera series to feature a 36x zoom lens with Wide-D, as well as horizontal resolution of 530 TV lines, improved motion detection, spherical privacy zone masking with mosaic effect, and enhanced multi lines (more than two) for title. The FCB-EX1010P also features a slow AE Response Function that automatically slows the rate at which the exposure level changes. The rate can be set up to 32 times slower than when the Full Auto mode or Priority mode is selected. The new ultra-compact and lightweight FCB-EX11D camera is specifically designed for easy integration into mini-dome housings for superb observation. Its outstanding picture quality, excellent auto-focus performance and small size make it the ideal contender in space restricted environments such as underground inspection systems of oil gas pipes, low vision systems, police vehicles and more. The FCB-EX11D incorporates a 1/4-type EXview HAD CCD™ sensor and is equipped with a 10x optical zoom lens that can provide a 120x zoom ratio when combined with the digital zoom. In addition, the FCB-EX11D color block camera inherits many of the excellent features found in Sony's new FCB D version cameras such as slow AE Response, Advanced Spherical Privacy Zone Masking and Multi-line on-screen display. With its excellent picture quality, compact size and feature-rich design, the FCB-EX11D is ideal for a wide range of applications. The new ultra-compact and lightweight FCB-EX11DP camera is specifically designed for easy integration into mini-dome housings for superb observation. Its outstanding picture quality, excellent auto-focus performance and small size make it the ideal contender in space restricted environments such as underground inspection systems of oil gas pipes, low vision systems, police vehicles and more. The FCB-EX11DP incorporates a 1/4-type EXview HAD CCD™ sensor and is equipped with a 10x optical zoom lens that can provide a 120x zoom ratio when combined with the digital zoom. In addition, the FCB-EX11DP color block camera inherits many of the excellent features found in Sony's new FCB D version cameras such as slow AE Response, Advanced Spherical Privacy Zone Masking and Multi-line on-screen display. With its excellent picture quality, compact size and feature-rich design, the FCB-EX11DP is ideal for a wide range of applications. High Sensitivity and Superb Picture Quality for Surveillance Monitoring, Police Vehicle and Inspection Applications. Sony continues to add choice and flexibility to its FCB Series with the introduction of the FCB-EX20D camera. The FCB-EX20D incorporates a newly designed 1/3 type Super HAD CCD II sensor that provides increased sensitivity compared to cameras featuring the successful 1/4 Super HAD CCD. The camera can operate under a minimum illumination of 0.25 lux. When combining Sony's advanced Digital Signal Processing technology with this new CCD, the FCB-EX20D achieves a horizontal resolution of 530 TV lines, providing extremely clear and detailed images. Featuring a Day/Night function, this camera offers optimized sensitivity in changing light conditions, which is a typical challenge for 24/7/365 surveillance monitoring applications. In addition, the camera provides an extremely wide horizontal angle of view (5.4º to 50º) with a 120x zooming capability for exceptionally close inspection to capture detailed information. Moreover, to further improve camera performance, the FCB-EX20D offers a number of sophisticated functions such as advanced spherical privacy zone masking with a mosaic effect, video motion detection, multi-line on-screen display and slow AE function. When utilized in a fixed-type, mini speed-dome, or as a Pan/Tilt.Zoom (P/T/Z) camera, the FCB-EX20D is the definitive choice for security and monitoring systems. This camera is so versatile that it can be used in video conferencing and low vision systems, to police vehicles and underground inspection (oil and gas pipelines). High Sensitivity and Superb Picture Quality for Surveillance Monitoring, Police Vehicle and Inspection Applications. Sony continues to add choice and flexibility to its FCB Series with the introduction of the FCB-EX20DP camera. The FCB-EX20DP incorporates a newly designed 1/3 type Super HAD CCD II sensor that provides increased sensitivity compared to cameras featuring the successful 1/4 Super HAD CCD. The camera can operate under a minimum illumination of 0.25 lux. When combining Sony's advanced Digital Signal Processing technology with this new CCD, the FCB-EX20DP achieves a horizontal resolution of 530 TV lines, providing extremely clear and detailed images. Featuring a Day/Night function, this camera offers optimized sensitivity in changing light conditions, which is a typical challenge for 24/7/365 surveillance monitoring applications. In addition, the camera provides an extremely wide horizontal angle of view (5.8º to 52º) with a 120x zooming capability for exceptionally close inspection to capture detailed information. Moreover, to further improve camera performance, the FCB-EX20DP offers a number of sophisticated functions such as advanced spherical privacy zone masking with a mosaic effect, video motion detection, multi-line on-screen display and slow AE function. When utilized in a fixed-type, mini speed-dome, or as a Pan/Tilt.Zoom (P/T/Z) camera, the FCB-EX20DP is the definitive choice for security and monitoring systems. This camera is so versatile that it can be used in video conferencing and low vision systems, to police vehicles and underground inspection (oil and gas pipelines). Combining superb picture quality with a variety of convenient functions, the FCB-EX45MC block camera enables you to offer your customers a remote controllable monochrome solution. Incorporating a 1/4 type B/W CCD with EXview HAD technology, the FCB-EX45MC camera achieves excellent sensitivity of less than 0.01 lux - making it ideal for extremely low-light environments traditionally needed in security dome, traffic monitoring, and facial recognition applications. Featuring a high performance Digital Signal Processor (DSP), the FCB-EX45MC camera realizes a high resolution of 520 TV lines. The FCB-EX45MC camera features the same specifications, dimensions and mounting holes as the FCB-EX45M camera, but comes equipped with an 18x lens featuring Sony's new "SMART" Lens Control technology and upgraded 3-D "Spherical Privacy Zone Masking" function. Combining superb picture quality with a variety of convenient functions, the FCB-EX45MCC block camera enables you to offer your customers a remote controllable monochrome solution. Incorporating a 1/4 type B/W CCD with EXview HAD technology, the FCB-EX45MC (CCIR) camera achieves excellent sensitivity of less than 0.01 lux - making it ideal for extremely low-light environments traditionally needed in security dome, traffic monitoring, and facial recognition applications. Featuring a high performance Digital Signal Processor (DSP), the FCB-EX45MCC camera realizes a high resolution of 520 TV lines. The FCB-EX45MCC features the same specifications, dimensions and mounting holes as the FCB-EX45MC camera, but comes equipped with an 18x lens featuring Sony's new "SMART" Lens Control technology and upgraded 3-D "Spherical Privacy Zone Masking" function. The FCB-480C color block camera combines a 1/4 type EXview HAD® CCD with a minimum illumination of 0.7 lux (typical 50 IRE) and an auto ICR function. Comes equipped with a 18x lens featuring Sony's new "SMART" Lens Control technology and upgraded 3-D "Spherical Privacy Zone Masking" function. The BRC-300 (NTSC model), is Sony's first robotic camera to offer the quality ofSD 1/4.7 CCDs for brilliant resolution. Specifically designed for remote video-shooting applications, the BRC-300 incorporates three 1/4.7-type Advanced HAD™ CCDs to provide high-quality, high-resolution images in both 4:3 and 16:9 modes. With its E: Flip function for desktop or ceiling mount flexibility, the BRC-300 is ideal for use in a wide range of remote video shooting applications such as houses of worship, distance learning, corporate training, and cable TV broadcasting. In addition, its all-in-one design makes it an affordable alternative to separately configured cameras, lenses and P/T/Z mounts. And with a high-accuracy and wide-range pan/tilt/zoom capability, users can precisely capture the right points of the viewable area surrounding the BRC-300 to meet their needs. They can also easily operate the camera with Sony's optional RM-BR300 remote control unit, which is equipped with an ergonomic joystick, and feature-rich control panel. The BRC-300 comes equipped with a card slot that accepts optional interface cards, enabling the BRC-300 to be integrated into every kind of system from S-Video to RGB, iLINK™ DV interface, SDI or even fiber. In addition, two remote control interfaces (VISCA™ protocol) are available to provide additional expendability and flexibility for user's remote shooting needs. The BRC-H700 combines a high picture quality HD 3CCDs camera with pan/tilt/zoom mechanism, wrapped in a sleek, compact body. Like its standard definition family member, the BRC-300, the BRC-H700 can also be mounted on the ceiling. The BRC-H700 supports analog RGB, Y/Pb/Pr output as standard and is also equipped with a slot for optional cards resonding to diverse needs. by inserting optional cards into this slot, HD-SDI (HDBK-HD1), down converted SKI (HFBK-SD1), computer XGA (HFBK-XG1) and HDV™ (HFBK-TS1) formats can be used. The BRU-H700 HD optical mutliplex unit with the BRBK-H700 HD optical multiplex card enables the BRC-H700 to transmit uncompressed digital data without deterioration through the CCFC-M100HG HD optical fiber cable. The same RM-BR300 remote control unit for the BRC-300 can be used with BRC-H700; it will simultaneously control up to 7 cameras from a distance. The BRC-Z330 is the latest addtion to the Sony BRC Series line up. The unit is equipped with a 1/3-type 2-megapixel CMOS image sensor. The competitive list price is in answer to today's growing demand for full HD images from robotic cameras. The camera's wide pan/tilt ranges and smooth pan/tilt/zoom capability make it perfect for deployment in locations such as houses of worship and auditoriums, as well as at educational facilities, conferences and concerts. The BRC-Z330 is the smallest model in the Series line up. It's compact and light body makes installation and operation very smooth. Moreover, thanks to the adoption of a direct-drive pan/tilt mechanism, it has a quiet operation that minimizes interference with ongoing events and helps it blend in natually with surrounding environments. Above all, this camera also incorporates a relatively low-power-consumption CMOS image sensor. HD 1/4 3 CMOSs camera with pan/tilt/zoom mechanism, wrapped in a sleek, compact body. Like its other family members, the BRC-300 and the BRC-H700, The BRC-Z700 can also be ceiling mounted. The BRC-Z700 supports simultaneous outputs of analog HD Y/Pb/Pr output as well as Y/C and composite in Standard Definition (SD). It is also equipped with a slot for optional cards to adapt to diverse needs. By inserting the optional BRBK-HSD1 card into this slot, High Definition SDI (HD-SDI) as well as down converted SD SDI output is possible by proper selection (not simultaneously). For HD optical multiplex remote operation, the BRC-Z700 requires a BRBK-MF1 board. Boards used with the existing BRC-H700 camera are NOT compatible with the BRC-Z700. When used with the BRU-H700 HD optical multiplex unit, the BRC-Z700 in combination with the new BRBK-MF1 board, can transmit uncompressed digital data without deterioration through the CCFC-M100HG HD optical fiber cable. The same RM-BR300 remote controller currently used with the BRC-300 and BRC-H700 cameras can also be used with the BRC-Z700. The RM-BR300 can simultaneously control up to 7 cameras from a distance. to continental United Sates, Excludes Alasaka-Hawaii and any other US territory. If you have a pictures that you want us to see upload here.